By Gary S. Gordon, Fish With Gary™ Tackle Co. So, you want to become a better kokanee fisherman? Yes, we all do. I assure you that you can be, but it takes some effort. It is not just getting out on the water, but it is using solid knowledge about kokanee that will make you more effective when you are on the water. A very wise Native American saying goes like this. "If you want to understand the owl, you need to understand the mouse." If you want to become a better kokanee fisherman, you need to understand more about kokanee. And to know more about kokanee you need to understand the factors that affect kokanee. You need to know about kokanee biology, feeding habits, and what is really going on with the water at depth where kokanee thrive. I present the following information (and opinion) after years of study, and years of applying that study to the practical skills needed for very successful kokanee fishing. I have tried to make this as brief and as simple to follow as I can. My suggestion is that you do not give this a single read. Print this out and read it often. I welcome feedback and suggestions. The idea is that if you get all of these factors right in your presentation, then you are fishing with 100% efficiency. There is some truth that IF you are in the right temperature zone, using a correct dodger at the right speed, then you are hovering around 50-55% effectiveness. Even a blind sow gets an acorn once in a while. But you will be at 0% effectiveness if you are not in the correct temperature and using the wrong presentation setup. As a fisherman, you really already know that from practical experience. Taking the time to learn about all of these related factors will most likely help you become a better overall fisherman for kokanee and other species as well. The single best predictor of kokanee location is temperature. I am not talking surface water temperature, but rather the correct temperature down in the water column, or temperature at depth. For kokanee, the preferred temperature is close to 54 degrees. It is true that they can be found at temperatures between 44 and 59 degrees. Below 54 degrees the kokanee are less active. Much above 54°, any extended stay will have detrimental or even lethal effects. Kokanee biology functions best at 54 degrees, and they will seek it out if it is available. That temperature provides the most efficient growth from feeding. That temperature also allows for the least amount of energy to be consumed for swimming and generally being in the business of being a kokanee. Wherever that 54 degrees is in the water column, that is your target depth. Early season temperatures may not be as high as 54°, which accounts for sometimes slower fishing. Water temperature is regulated mostly by sunlight, and then to a lesser amount by inflows. The coolest water throughout the water column will be in the winter and early spring, and the warmest will be in the summer. Between these times, water temperature cycles from gradually warming to the warmest, and then cycles from gradually cooling to the coolest. This temperature cycle moves the ideal target temperature of 54 degrees up and down the water column. Determining where that ideal temperature is can be trial and error if you are unable to measure it directly. There are a few reliable devices available that you can use such as the Fish Hawk model 840. Sadly, Koch is no longer importing the inexpensive digital temperature device. Since kokanee have a very elongated air bladder, you can use your fishfinder to determine their approximate depth. Kokanee will show a bright orange with a color fishfinder. Take an average depth of the images, and have that as your initial target depth. Set your presentation within five feet top and bottom of that target depth. If the fish that hit your presentation are smaller than what is generally being caught, lower your target by five feet. Continue this process until you are zoned in. Generally, kokanee fishing picks up in the spring, when water temperatures are warming, and continues through August. This period can be broken down further into categories, each with distinctive features and methods for best approach to your fishing. But to grasp the reasons for the differences, some additional discussion is necessary. Effect Of Plankton On Light In The Water Column. Your lure may be one color on the surface and yet be a dull or almost invisible presentation at depth. That bright shiny dodger reflects sun on the surface and blinds you with reflection, but that same reflection at depth may be only the dimly lit color of the water it is in. The net effect is that both your dodger and lure can become camouflaged at depth. But knowing about color and contrast at depth will keep your entire presentation vital and effective. Water absorbs light. Even the clearest water will ultimately finish off all light at some depth. 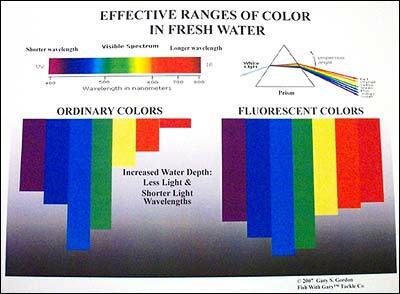 What is actually in the water will reduce light penetration. For example, if the water is very muddy, light will not penetrate very far. If the water is less muddy, light will penetrate further down the water column. We look at light penetration in terms of water clarity. For the kokanee fisherman, the clarity issues come mostly from silt, plankton growing in the water, and surface disturbances. Light does not always travel in a straight line. In fact, when there are particles in the water, the light that penetrates is actually scattered in different directions. The same effect can be seen when driving at night. On a clear night the headlights project out a good distance; but when going through fog, the light from those headlamps scatters. The same amount of light is being projected from the lamp, but the effect of that light and where it goes winds up being quite different in a clear versus fog situation. Kokanee are filter feeders (they have gill rakes) and their diet consists of plankton. Plankton has the same effect on light in the water column as fog does in air. Plankton is the general term. Phytoplankton is the plant plankton that forms the bulk of the kokanee diet. Phytoplankton is light dependent, reacting with light to grow. Because it is plant, it does not move around on its own, but is pushed about by currents and wave/wind action. Phytoplankton has its own set of minimum light and nutrient requirements. Zooplankton is the animal plankton. Zooplankton feeds substantially on the phytoplankton. Zooplankton has the ability to move about without being totally dependent on current and wave/wind action. For our kokanee, the most important zooplankton are daphnia (water fleas). Daphnia are intolerant of light and when sunlight hits the water, daphnia descend down the water column. In spring, the kokanee are waiting for them from below. The chase often ends (or continues) with kokanee jumping out of the water, much to our entertainment. The absolute enemy of kokanee is the tiny mysis shrimp. Mysis eat the phytoplankton at such a rate that it virtually eliminates the food supply available to young kokanee. If there are no young kokanee, soon there will be no mature kokanee. These lessons were learned too late in Flathead Lake and Lake Tahoe. Plankton growing in the water scatters light. But this scattering of light is actually a good thing for the kokanee fisherman because of the growth of plankton in the water. Kokanee are filter feeders, and their diet consists of this plankton. Without this plankton, there would be no kokanee fishing. More plankton, more food, more scattering of light. So bring on the light scattering plankton!! When light is scattered, there is less of it to penetrate below what scattered it. In the case of plankton, it can be thought of as a canopy effect. The growing plankton shades the water beneath it. Again, less light below. In a healthy kokanee lake or reservoir, there will always be less light at depth. Phytoplankton provides nourishment to kokanee in the form of sugars. These sugars are made as a result of photosynthesis, which is the interaction of light energy with chlorophyll. A by-product of this process is oxygen, which the kokanee very much appreciate having. But it takes a certain amount of light energy to drive the system. Healthy growing phytoplankton is actually light specific in the water column, and below which there is no active phytoplankton. If the light level at depth drops to 10% of what would be 100% at the surface, phytoplankton cannot continue with the photosynthesis. Abundant growth shades all water progressively downward until it reaches that 10% light level. That 10% light limiter, formed by the phytoplankton canopy above it, makes a downside limit of where phytoplankton thrive in the water column. The more abundant the phytoplankton growth, the less light there is beneath the phytoplankton canopy. As long as the kokanee can find that plankton in their preferred temperature range, all is good. Kokanee gorge and grow, and grow and gorge. But as the season progresses, that 54 degrees continues to lower in the water column, and reaches a point where there is no growing phytoplankton where the 54 degree temperature depth is located. The temperature range has dropped in the water column to the point where 54 degrees is below 10% light. The result is that the phytoplankton, though abundant, is in a temperature that is too warm for the kokanee. When that happens, kokanee will stop eating. And stop growing too. This is when kokanee enter the pre-spawn period. And changes start happening to the kokanee, as their stored energy (from gorging) is then directed to those body parts necessary for spawning. A key factor for growing large kokanee is how long that 54 degree zone can remain within the growing plankton. Keeping that zone in the phytoplankton is influenced by inflows (the cooler the better), reservoir depth, and amount of heating (infrared) by the sun. If the water warms too quickly, kokanee will not have enough time to feed to achieve their maximum potential size. And there can be even more dramatic size downward if there are too many mouths for the available food supply at the temperature where kokanee prefer. Obviously, the spring weather and natural spawn success have a lot to do with it in either case. A mild spring, with an excellent slow melting substantial snowpack is ideal. You can easily confirm the pre-spawn time. If you land a kokanee and clean it, and if the stomach is empty, that not only tells you it is pre-spawn, but it also tells you that the 54 degrees is now below that 10% light threshold in the water column. Fortunately for us, kokanee will continue to strike out at a proper setup, even in reduced light. Even in no light. Understanding this fundamental principle that water absorbs light and that there is always less light at depth is the first step in deciding what dodger and lure combination (the setup) to fish. The illustration on the left shows the concept of temperature over the season and light reduction at depth. While the exact light reduction and depths are not going to be true for every body of kokanee water, nonetheless it is still a valid representation of what is to be expected as you travel down the water column. To proceed further, we have to understand another two interlocking principles. Kokanee are first attracted to proper vibration, then to color. It is not the other way around. Proper vibration and color cannot be separated. Yes, scent does play a role, but even the correct scent will not make up for a bad presentation at incorrect depth, speed, and dodger/lure choice. In fact a bad scent choice will condition the kokanee not to strike. That is one of the best reasons to have scent choices on hand, and to move to new fishing areas with a different scent. Simply staying in the same area but changing scents will do nothing to remove the bad scent already in the water. Only time and current can do that. Regardless of species we have all seen at times fish come and have a look at our presentation, only to swim away. When we send a setup to the target depth we are trying to accomplish two things. We want our setup to attract our target fish, and we want our setup to provoke a striking response to our lure. Let me repeat, we are placing our setup at a target depth to get both an attraction response and a striking response. The following chart generally describes this process, and sets forth the significant discussion to follow. The whole point of kokanee fishing is to catch kokanee (and enjoy being on the water of course). But we do not put microscopic plankton or tiny daphnia water fleas on our hooks and go from there. As it turns out, kokanee are in fact attracted to colors, contrasts and objects that do not exist naturally in their environment. Leading the proper setup is a dodger. The lure is then attached to the dodger by a short leader. Frankly, the shorter the better - a minimum of five inches but no more than 14 inches (except for apex types). The deeper your target depth is in the water column, the shorter the leader. For squids, RGTs, hoochies and bugs a five inch setback is more productive than a 14-inch setback regardless of target depth. But what does the dodger really do? The dodger is the most crucial part of your setup. And Fish With Gary™ dodgers are even more effective than ordinary dodgers for substantial reasons discussed below. What is astounding is that given the importance of the dodger, why is it that so few kokanee fishermen give it second billing in telling their success stories? The most likely answer centers on a general lack of understanding of what the dodger actually does. As the dodger is moved forward through the water, it displaces water. When water is displaced, it creates a wave. The kind of wave and its intensity is determined by the shape of the object moving in the water and how fast it is moving. While a sleek shape will still make a wave, a shape that moves side to side will produce more intense waves. Squids, RGTs, hoochies and bugs are sleek. But while they still make a wave as they are pulled through the water, they do not make much of a wave. Yet place them a short distance behind a dodger that is moving side to side, and you have given your sleek presentation abundant action. The shape of the dodger and the speed it is going in the water determine the intensity of this side to side action. Speed and shape determine how much water is displaced over a set forward distance. This back and forth displacement of water is creating a particular kind of wave - a low frequency sound wave. Even though we cannot hear it, the important thing is that kokanee can hear it. How they can hear it deserves some comment. Kokanee have three tools to aid in sound detection. The first is their inner ears up front. The second is the lateral line on each side. Lateral lines are really a series of pores that contain a network of sensory structures called neuromasts. The third is the very elongated air bladder that kokanee have (much longer than in other freshwater fish). This air bladder acts like a drum in picking up sound waves. The three tools work together to give the kokanee a three-dimensional picture of what direction the sound is coming from. Amazingly, sound waves (displacement) travel almost five times faster in water than in air, and over great distance. The same incredible speed is realized when tsunami waves are formed and take off. The air bladder is the primary tool for picking up long distance sounds. The lateral line and the inner ears are specialized to pick up short durance sound. The most effective presentation will generate both kinds of sound. We will come back to that in a moment. Be assured that the sound you are creating with your dodger travels outward, upward, downward, backward, sideways and forward at speeds way in excess of the speed you are trolling. And kokanee can swim way faster than you are trolling. The water world is not silent. Not only is your dodger sounding off, but so is your boat, your downriggers, boom box music from unthinking boaters, and a host of other noise/sound generators, including other fish in the water, and other fishermen with their underwater hardware. The whole idea is to attract kokanee to your proper setup, despite the other sounds in the water. Fortunately for us, kokanee have some discernment, which is to say they can identify sounds that attract them, as well as identify sounds that repel them. This ability to respond one way or the other to in-the-water stimuli is flat out astounding. In fact, this ability is the one of the key components to just how kokanee manage their lives. Thrown in the mix is the fact that kokanee are by nature seriously curious and seriously aggressive. They not only want to know what is going on in their world, they want to control what is going on. Their ferocious fight and acrobatics lend some to believe that there must be some Tasmanian devil somewhere in their gene pool. If you are to be a successful kokanee fisherman, then you want your setup to make the kind of sound waves that will in fact attract kokanee. This is to also say that if you want to be a successful kokanee fisherman, you do not want your setup to make sound waves that repel kokanee. In my opinion, using flashers either ahead of the dodger or on the downrigger ball produce just the kind of sounds that repel kokanee. The reasons are basic. Every manufacturer of flashers claims that their action produces sound that mimics wounded baitfish. And that they do, without question. Essentially flashers are predator attractants. Except kokanee are not attracted to wounded baitfish. But fish that eat kokanee are attracted to wounded baitfish. These predators that eat kokanee also produce sound as they move in the water. Any right thinking kokanee (a survivor) has learned the sound of predators and what attracts them. Kokanee hear that sound and go the opposite direction. You might in fact pick up a kokanee using flashers because there is always a really dumb one in the mix. But you will scatter the rest quickly. Rather than taking advantage of the kokes being together, you scatter them for some other fisherman to catch. So you move on to another location to repeat the process. Eventually you might even get your limit, and call it fair fishing, and think the flashers did the trick for you. The truth is that the flashers tricked you. But if you lose the flashers in your presentation, you will finally enjoy much better fishing. Many times I have heard and read that when the fishing is slow, use flashers. Bad advice. If the fishing is slow, change your setup to a larger dodger and different matching lure. Change location. Change scent. Change speed. Adjust depth. And while I'm at it, the so called "electronic" gizmos on lures and dodgers that are out there are claimed to be deadly on kokanee, yet the same gizmo is lauded as mimicking wounded baitfish for other species. Why would anyone who is fishing for kokanee use a setup designed to attract predatory fish such as mackinaw, browns or large 'bows? The bottom line is this. If what you are doing repels kokanee, your fishing is slower and much more difficult. If what you are doing attracts kokanee, then your success greatly increases. Back to sound generation. The attraction process is really of two types. Far field (long distance) sound is discerned by the kokanee's air bladder. A kokanee will hear that sound of displacement as generated by your dodger. Your lure does not generate the kind of attraction sound that works over long distance. Instead, the lure generates a near field (short distance) sound. Apex type lures and Wee Tads do generate some far field sound, but, as will be explained shortly, the better sound for a lure is near field (short distance) attraction sound. We want the dodger and the lure to be complementary to each other to be most effective. We do not want one to work against the other. We want the far field sounds of the dodger to attract the kokanee, and we want the near field sounds of the lure to seal the deal. The sequence of this process is vital. It is the dodger and not the lure that first attracts. And there is nothing in the lure (except added scent) that will attract kokanee over distance. Scent does not stimulate the air bladder, lateral lines or ears. While a kokanee has fantastic scent detection skills, for most of the kokanee fishing season there is little need for the kokanee to rely on scent for survival when compared to sound detection skills. If sound is so important, why is color an issue? Yes, sound is vital because it attracts the kokanee to your setup over distance and over competing sounds present in the water column. Color does not attract over far distance. However, color is a significant part of the equation for near field attraction. For near field attraction, kokanee are not only using their inner ears and lateral lines for short distance sound detection, they are also using their eyes and field of vision to discern shape, contrast and color. Sound detection and sight are working together in the water environment the same way we use sight and sound working together in our air environment. When sound and color are used together, multiple stimuli are presented that stand out against other sounds and colors and shapes in the water. With more attracting stimuli, the result is greater efficiency in presentation. While keeping in mind sound in a near field attraction, we must consider what the fish sees through its eyes. Remember, sight and sound are working for the fish, and you want sight and sound to work for you. Sight is a near field issue. Not only is there reduced light at most of our target depths, but the water is clouded with organic and inorganic particulates as discussed in the beginning of this paper. Recall that such particulates absorb light and bend light. The sight distance window is lessened as you descend the water column. Make no mistake, kokanee can see up, down and all around. They see close up and farther out (depending on water clarity) at the same time, but not as clearly as we can. They can see effectively behind them as they swim, because their undulating swimming motion turns the head just far enough to see to very near the plane of the tail. Consider what it is that you are trying to do. You want your setup color-wise to be different than the water surrounding it. If your setup contrasts with the water it is in, it has a far greater chance to be noticed and targeted. Remember, we are seeking a striking response. Your setup must appear different than the predominant color of the surrounding water at that depth. As we descend the water column, certain light wave frequencies are absorbed (because water absorbs light). Here is the other prong of that absorption concept. As we go deeper in the water column, some of the colors we see at the surface will no longer be the same color at depth. At this point in the discussion I am speaking of ordinary colors - the color spectrum we can see. Fluorescent colors will be discussed in a moment. The longest visible color wavelengths are the reds. Shorter in descending order are orange, yellow, green, blue, indigo and violet. As you descend the water column, the longer wavelengths are absorbed, leaving the shorter wavelengths to continue down the water column. Those shorter wavelengths will ultimately be absorbed, even in the clearest of water provided you go deep enough. The kokanee fisherman is dealing with depths generally down to 100 feet, give or take. The typical kokanee body of water will have no light in later season beyond 75 feet. In very early season, there may be no light at 30 feet. 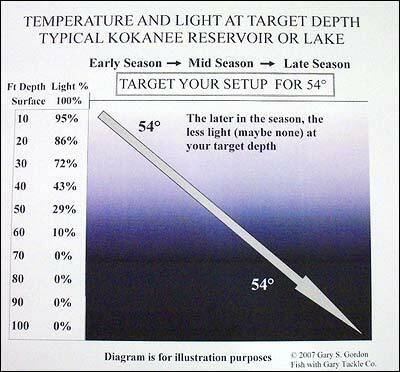 As you recall from earlier discussion above, the proper target depth for kokanee fishing is 54 degrees. And since that temperature descends the water column as the season wears on, the resulting less light at your target depth also means that certain ordinary colors are no longer what they appeared to be on the surface because their wavelengths have been absorbed. If you use such a color at depth, your presentation will be gray and not be of much contrast to the water it is in. Our lures are rarely of a pure color wavelength. But even the mixing of colors (hues) will still be subject to the same color deterioration at depth. Pink is a good example. Pink is not a color of the visible spectrum, but is a mixing of red and white. White is not a color of the spectrum, but is all colors of the visible spectrum. Thus in pink, a little of the color will respond to green and blue wavelength at depth. But the color intensity will be mostly dull. From what you now know, ordinary pink is not the ideal choice for getting noticed at depth. While this might seem confusing to us above water, it is still the reality of the color situation in the water and at depth. Perhaps some encouragement is in order. To be "expert" of color at depth you need not memorize anything. Because most of our kokanee fishing occurs in green or blue light wave frequencies, we want all of our presentations to show up in green and blue light. Enter the amazing world of fluorescent colors. No intense scientific discussion is needed here. What you need to know is this. A true fluorescent color will remain its color when struck by a lower light wave frequency. If a true fluorescent orange is struck by a green light (lower frequency than orange light), it will remain orange. The same is true for all of the fluorescent colors. And that means that if you use true fluorescent colors in your setup, your setup will be seen at depth. True fluorescent colors tend to be brighter as well, making for higher visibility. Not all materials on the tackle market are of true fluorescent colors. You can easily test whether a color is a true fluorescent by taking your lures and dodgers into a dark closet, and then shining a black or UV light on them. If the color seen is the color you saw in full light, you have a fluorescent color. Again, there is a difference in intensity of the color. Just because a material is fluorescent does not automatically mean it is intense. U.V. light is below the visible spectrum (of lower wave frequency), which means it cannot be seen directly. All U.V. light is dissipated in very shallow fresh water holding kokanee, because the water, plankton and other particulates in the water absorb all of it. It is well documented that there will be no U.V. light in the fresh water column below just a few feet. I have tested lures labeled "U.V." Most work very well in waters holding kokanee, and in particular the UV squids should be a part of your tackle box. However, lures labeled "U.V." would be more accurately labeled as "fluorescent." These "U.V." lures come in visible colors. Since UV is not visible, the color you see is fluorescent. As with all fluorescent colors, stimulation by a black light will make the color jump out at you. But these lures are in fact only fluorescent. But that is why they are good. They still need some visible light at depth to be most effective. They do not glow. Match one of these "UV" (fluorescent) squids with a Fish With Gary™ POWER Dodger and you have a great setup. Using true fluorescent materials in your setup will resolve issues of color shift in your favor. While some fluorescent colors will fade somewhat the deeper you are in the water column, they still are not gray if there is some light available to act on them. When using true fluorescent materials, the colors you are delivering at depth are those NOT ordinarily seen at depth. And that is exactly the effect you want. Your setup will be out of the ordinary, and kokanee will focus on it in the near field. Using fluorescent materials is not the only way to get your setup noticed. Remember that you are after contrast, or what I call vital contrast. Vital contrast can be obtained by using different fluorescent colors next to each other, or spaced in such a way as to create the illusion of not being connected. Components that contrast with themselves will stand out even more in dull watery depth. Contrast is the enemy of camouflage. Contrast is the better developed part of kokanee vision, and encompasses about 10 times larger visual window area than does color. The color window is directly in front of the kokanee, but contrast is not only seen in front, it is seen up, down, sideways, and backwards. Contrast vision overlaps color vision. Effectively presented, color is a great contrast. When color and contrast are placed effectively presented, color and contrast are in front of the kokanee to see and react to. This allows the kokanee to put its mouth where the color is - which is pretty much what you want!! This diagram most certainly demonstrates vital contrast. 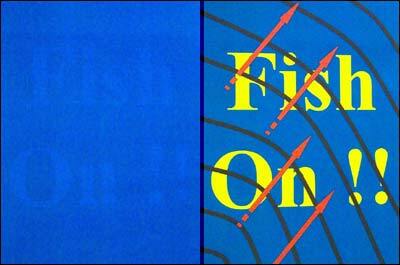 The diagram on the left also has embedded the words "FISH ON!!" But because of lack of vital contrast, it is difficult to see. There is another fantastic way to achieve this vital contrast at depth, and that is the use of glows. Glows are termed phosphorescent (or luminescent) as they carry their own light to depth. No intense scientific discussion is needed here either. Glows emit light when the light source that charges them is removed. On the other hand, fluorescent materials appear brighter in light, but do not glow when that light is removed. Most glows on the market and peddled to fisherman are of very poor quality. Their glow simply does not last even long enough to make it to depth, let alone work for you at depth. All Fish With Gary™ glows are of the highest quality and are termed extended glows for good reason. The natural glow beads in particular will glow for hours on a simple charge of sunlight for a few minutes. Stimulation of glows by using a black light is not very efficient, and the resulting glow does not last as long as sunlight stimulation. Glows clearly take on more importance when the level of light is less in the water column. As you descend below light in the water column in later season, glows make visible what would otherwise be invisible. And if the surrounding water is pitch black, the glow of light most certainly is the kind of dramatic contrast that will get your setup noticed. The ideal presentation in achieving vital contrast is one that makes generous use of fluorescent materials and glows, arranged in such a way to be in contrast with each other and in contrast with the surrounding water. And this is exactly what is incorporated into the entire Fish With Gary™ Tackle line. Each Fish With Gary™ Dodger and Lure comes with specific depth recommendations, as these depths have proven most effective for the colors and glows in vital contrast. That is because experience has taught that certain sizes, colors, and contrasts provide trigger stimuli within certain depth ranges. If you follow these recommendations you will be in the zone of greatest efficiency. Some closing comments have been saved for the unique design of the Fish With Gary™ Dodger. It is the unique design that pushes it way ahead of anything on the market. The dodger blade itself is a proven design providing a back and forth action. It maintains its stability without spinning at speeds approaching 3 mph, in excess of the usual trolling speed for kokanee. This back and forth action of the dodger makes the dodger act like a machine. While you supply the power in driving it forward, it supplies power in the form of waves going in all directions as it travels back and forth. As stated above, these waves travel out from the dodger in all directions, including forward. Each Fish With Gary™ dodger harnesses this forward wave energy. Attached to the forward part of the dodger by a crane swivel is a coated flexible wire that has a series of beads and a spinner or spinners. This then terminates into another crane swivel that you attach to your fishing line. You might expect that this arrangement would travel in a straight line through the water, but that is not so. The side to side action of the dodger makes the beads and spinner ahead of it go back and forth as well. The effect is somewhat akin to the end of a whip, but not quite as extreme. The addition of the wire, beads and spinner(s) adds a tremendous boost to your setup. While the dodger blade attracts far field (long distance), the beads, and the spinner(s) on the leading wire are near field (short distance) attractors. Here is what is going on with the beads and spinner in front of the dodger. Because the beads and spinner(s) are being moved about by the dodger, they are creating short field sound. The spinner(s) do not consistently spin as you would expect. Instead, their movement in the water makes the spinner(s) come in contact with the glass beads. Metal versus glass produces a sound. In this case the two produce an irregular sound that alternates with some spinning, and some "tap-tap" of the metal on the glass. There is nothing in nature that this imitates, and this sequence of short field sound is itself a contrast to the natural water environment. Add to this is the natural movement of the glass beads working against themselves as this setup is whipped through the water. And all of this is going on while your dodger is still producing far field sound, attracting other kokanee to your setup. A gathering of kokanee is more likely to result in a strike than a single kokanee. While your sound generating machine is working, your kokanee has been drawn close enough so that the colors and contrasts are within its sight window. A curious thing happens at this point. Having been drawn to the sound, the kokanee will see a particular color and contrast sequence. Once seen, this color and contrast sequence effectively imprints the kokanee with that combination, even if briefly. If your dodger and the upfront beads and spinner are of the same color and contrast, you increase that imprinting. And if your lure is of the same color and contrast, then you give the kokanee a target that it does not fear. That is why it is absolutely critical that your dodger setup and the lure be matched. The lure is making short field vibrations and adding color and contrast, and adding scent. So now you have the complete picture. Far field vibrations attract, short field vibrations and colors in consistent vital contrast imprint the kokanee and provoke the strike. The Fish With Gary™ dodger and matching lure work as a team to increase your success. No other kokanee dodger on the market produces both far field sound and near field sound. No other kokanee dodger on the market is as effective in imprinting the color and vital contrast necessary to produce a reliable biting response. Photographs of a typical Fish With Gary™ Dodger and Private Collection Lure follow, showing the use of correct matching colors and contrasts. Leading the setup is a bright fluorescent (UV) blue (both sides) spinner. Next are two blue extended glow beads. Notice the spacing between the spinner and front beads and the bright color pads on the dodger blade. The color pads are bright textured fluorescent (UV) blue, set apart from each other to increase contrast. The glow eye is prominent up front. The glow eye and the color pads are on both sides of the dodger blade for increased visibility. The trailing beads continue the vital contrast theme: rich blue facetted pearlescent beads on each end, complimented with extended glow beads, two UV facetted glass beads in the middle separated by a gold bead. A coastlock swivel finishes the dodger, to make lure leader attachment easy and reliable. This lure is a proper and excellent match for the SYSTEM 2 Blue Dodger above. Leading the setup is a bright fluorescent (UV) blue (both sides) spinner, followed by facetted pearlescent, light reflecting blue beads, extended glow beads, gold beads, and a bright UV blue glass bead as the star in the middle. The tandem Gamakatsu #4 hooks are tied on quality 10# leader. A final word concerns the Fish With Gary™ 360 Degree Technology. Because kokanee can see up, down, backwards, sideways and all around, and since color and contrast are critical, all FWG colors (and glows) and contrasts are on both sides of the dodger and on both sides of all spinners. A fish does not need to be on the "correct side" to have the full effect of the color and contrast. Yes, to do this is more expensive, but it is more efficient. It puts the color and vital contrast where it will be seen (and thus do the most good) regardless of the position of the kokanee around it. You may have used dodgers and lures from other manufacturers that have color(s) on just one side. Ask yourself, if color is so important, why is it not on both sides? Using Fish With Gary™ Dodgers and Lures eliminates that discussion. All Fish With Gary™ Dodgers and Lures are designed for ultralight trolling. Once a fish is hooked, the dodger adds no additional resistance and will not be a drag factor in the fight. You fight the fish "mano a mano." Your ultralight rod with a responsive reel that can be adjusted to minimum drag will put you in charge of the fight. If you turn your rod 90 degrees away from the hooked fish, and then lower your rod tip to the water as you are fighting it, all while maintaining steady tension, this will greatly increase your landing percentage. Ultraviolet Radiation in Aquatic Environments-Underwater UV Penetration and Responses in Algae and Zooplankton, Piro Huovinen (2000) University of Jyväskylä, Finland. All text and diagrams © 2007-2014 Gary S. Gordon, Fish With Gary™ Tackle Co.